Big day: Up early to catch the train from Rome to Bari: four hours on a fast, smooth Frecciargento (silver arrow). 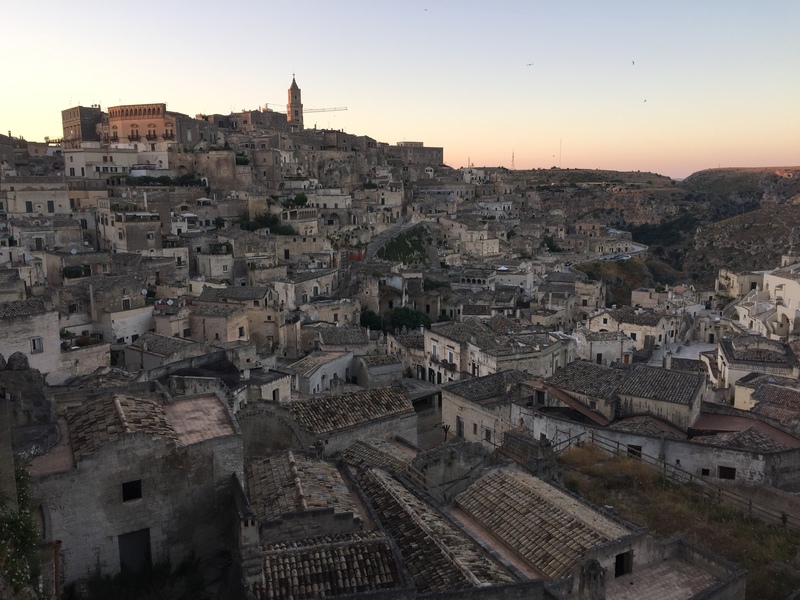 In Bari, we rented a car and drove about an hour and twenty minutes to our destination: Matera in Basilicata. So amazing! It’s one of the world’s oldest, continually inhabited places in the world. Mel Gibson chose it for filming The Passion because it looks so ancient. The people in the Stone Age carved caves as shelter. Later the caves were incorporated into buildings of tufa stone on the hillside. 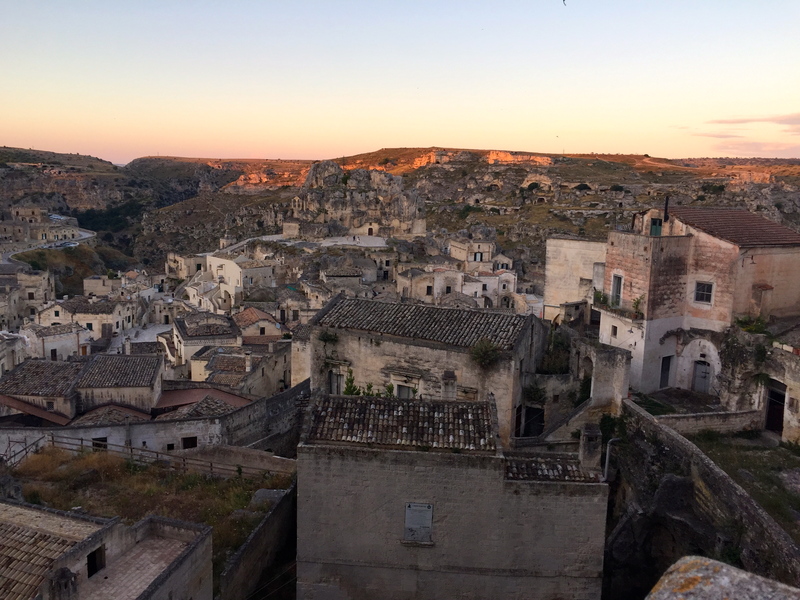 At one point, over 15,000 people lived in the Sassi (stones), often without plumbing and in one cave with the entire family, their goats, pigs, and chickens. As recently as the 1930s, malaria was common among the residents. After Carlo Levi, exiled by Mussolini, wrote Christ Stopped at Eboli, Mussolini moved everyone out of the Sassi and built modern apartments. 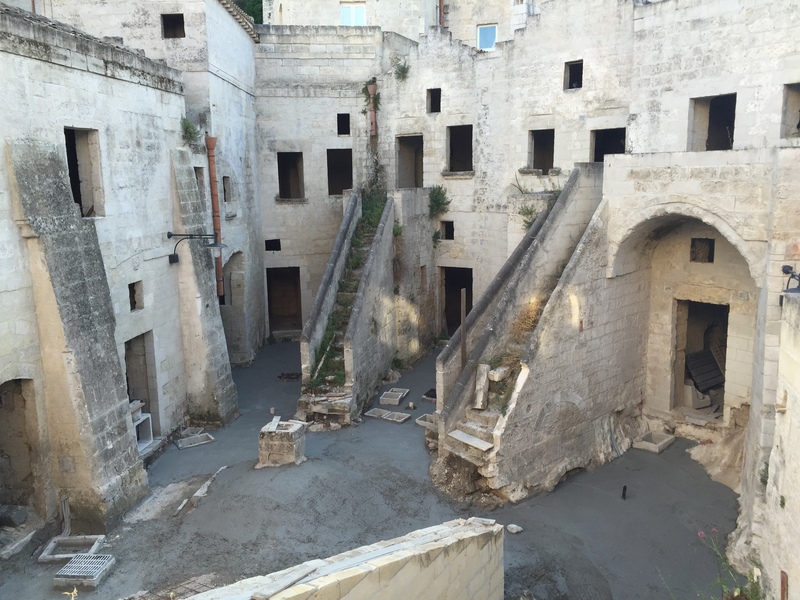 The caves were abandoned until people slowly began moving back in the last few decades. 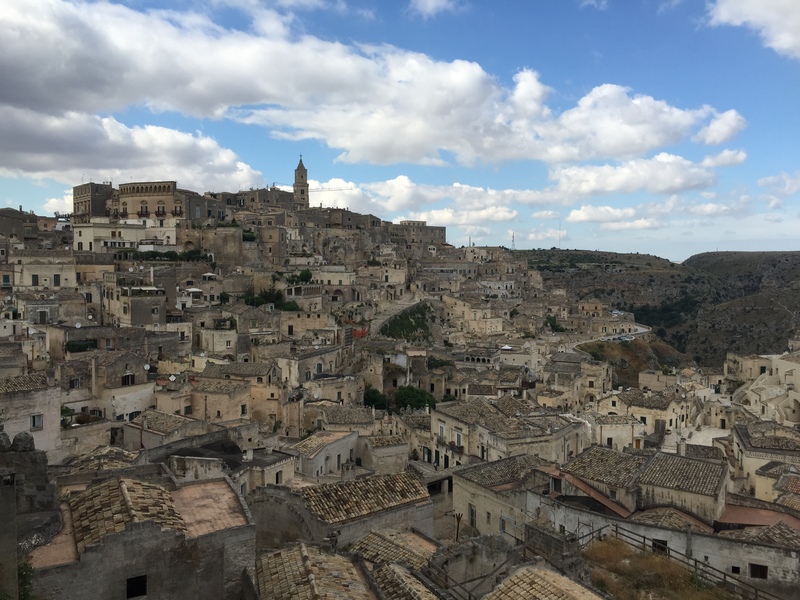 Matera’s Sassi are now a UNESCO world heritage site. 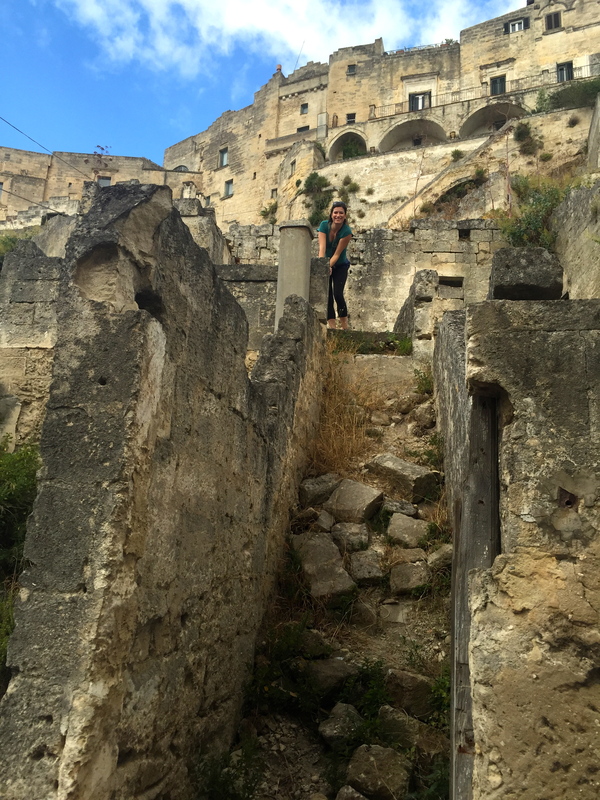 Restored cave homes next to ruins: living and ghost towns mixed. 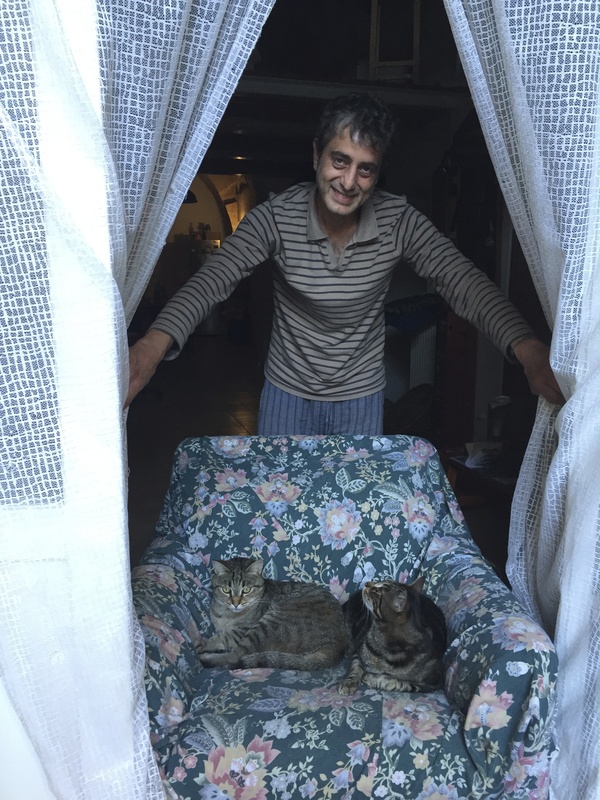 Our host, Luigi, lives with three cats, although he calls his place i due gattoni. A third cat has recently been added. 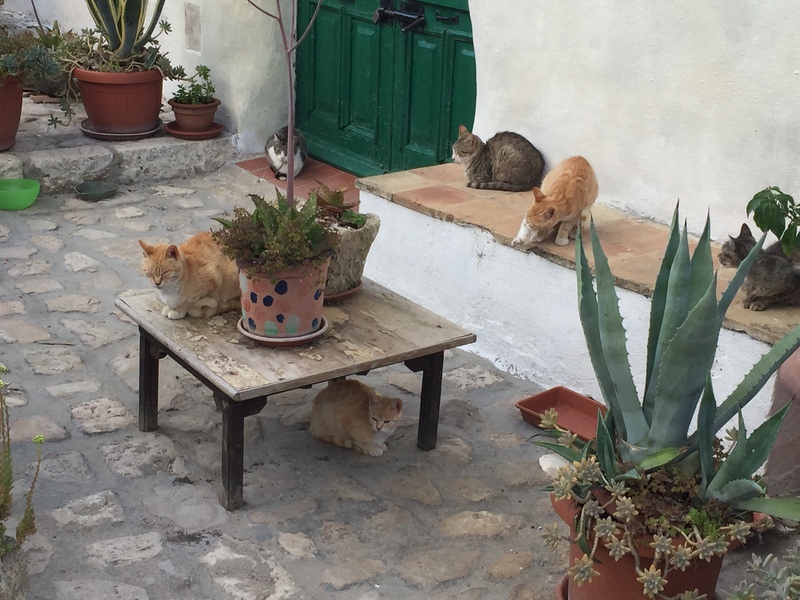 There are cats all over, which reminded us of Vernazza. We loved just wandering all around and getting lost. We’d be on these old, stone abandoned streets and alleyways. 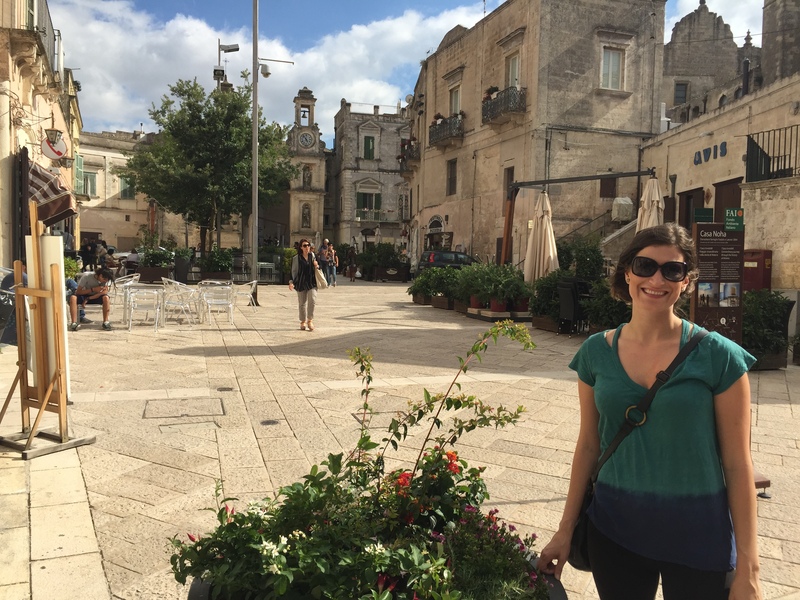 Suddenly we’d hear laughter and tableware and walk into a piazza full of people and cafes in the middle of a partial ghost town. Rick Steves has not discovered this place. There are tourists, but no Americans, and the people speak little English. No restaurants open after 8 pm for dinner. Our host Luigi con due gatti! At night it is so quiet. You can hear voices, the cat eating his dinner, the accordion being played upstairs among friends and laughter. What’s magical is that there is none of the motor noise, the cacophony of Rome. And we lucked out on the weather. It’s cool. We even wore jackets tonight for dinner. 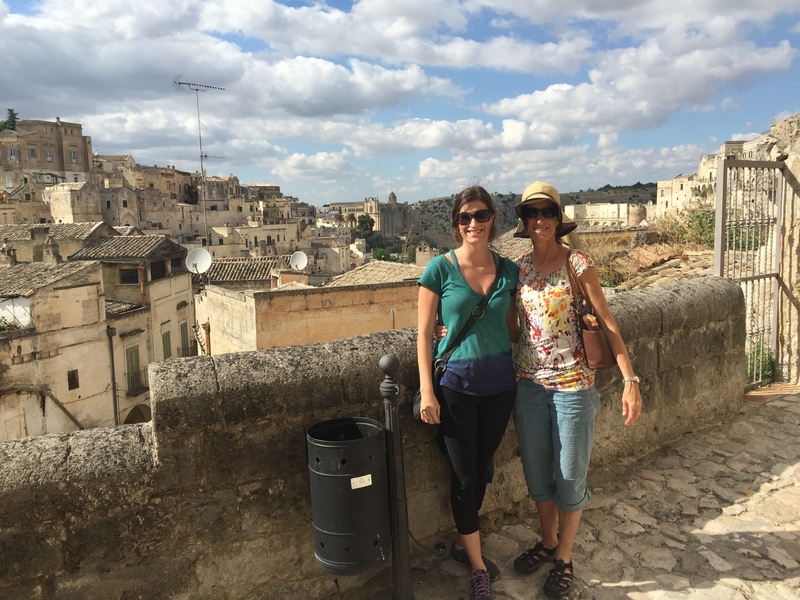 Most people do not speak English here, and we’ve only seen one other group of Americans. 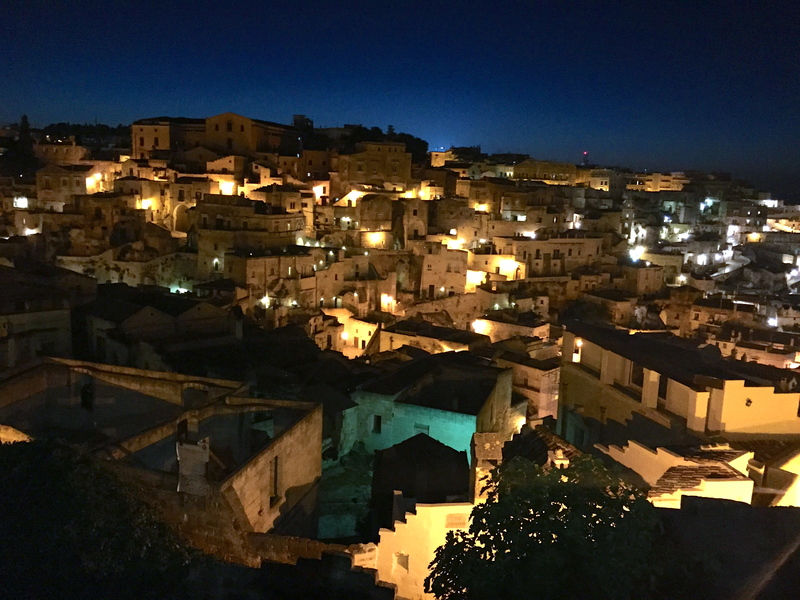 Here’s a little video I took from our apartment at night, looking up and then over the Sassi. 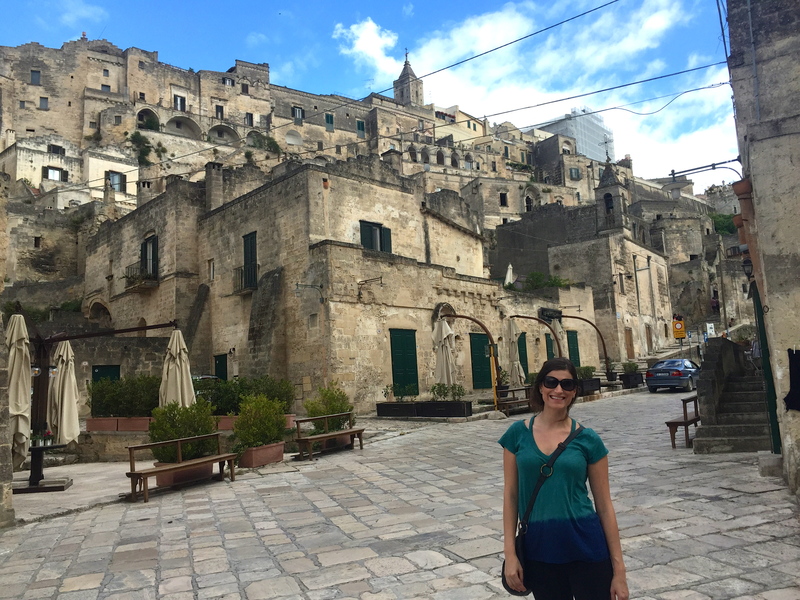 Matera is gorgeous! So cool that you captured it at all times of the day. I love all of the cats–like Hemingway’s house in Key West. My favorite photo is of the old men–did they know you were taking their picture, or were they oblivious in the thrall of their discussion of important things? You see them in every town. 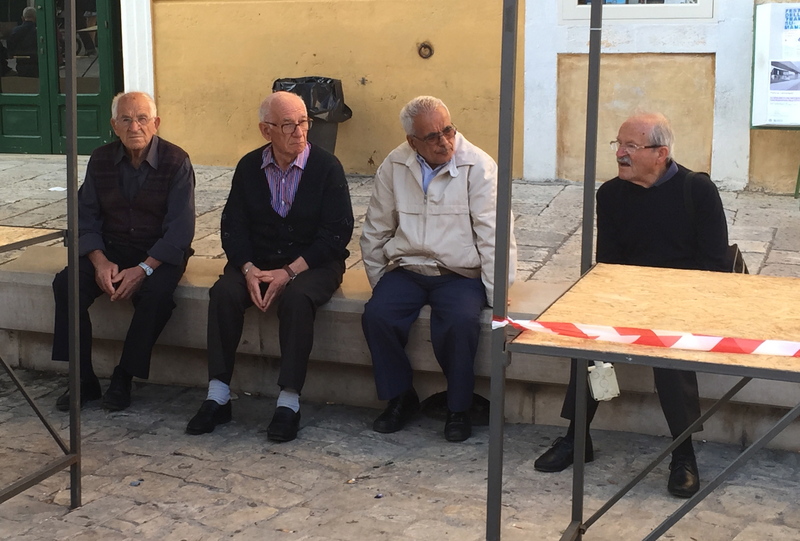 I would love to retire like that: observing the passagiatta and talking with lifelong friends.